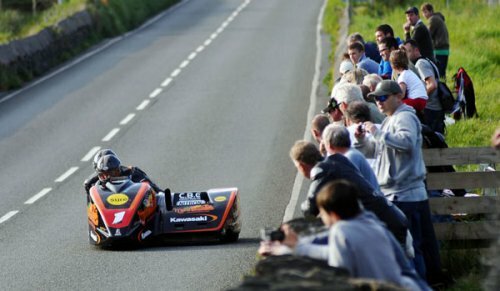 The veteran competitors showed the youngsters the way in Thursday’s Qualifying session for the 2012 Isle of Man TT Races. In the solo class Kiwi Bruce Anstey and evergreen Michael Rutter, both in their forties, posted the top Superbike times of the evening while fellow veteran Dave Molyneux overtook Tim Reeves fastest time of the week set the previous evening. After rain and damp conditions started the day, the weather cleared up in time for Thursday’s practice session to get underway only slightly behind schedule at 6.25pm and this time it was the sidecars to sample the Mountain Course first. The first few competitors went off in numerical order, so Dave Molyneux/Patrick Farrance were first away followed by John Holden/Andy Winkle, Tim Reeves/Dan Sayle, Conrad Harrison/Mike Aylott, Ben and Tom Birchall and Gary Bryan/Jamie Winn first away. The Birchalls were back in action after their spill on Monday evening. Molyneux led on the road and lapped at 112.198mph with Reeves slightly slower at 111.425 although he was quickest through the speed trap at 143.7mph. Conrad Harrison was also over 110mph with a lap of 110.496mph, Birchall and Greg Lambert were also over 108mph but Holden was again out of luck retiring at Kirk Michael whilst Andy King/Kenny Cole and Scott Lawrie/James Neave were also forced to stop. Second time around, Molyneux upped the pace with his lap being 113.538mph, the quickest of the week, with Reeves on 112.218mph, Bryan 110.781mph and Birchall 110.027mph. The chairs were able to get two laps in during the session before being flagged off and so, just after 7.10pm, the Supersport and Lightweight session commenced. Guy Martin and Bruce Anstey were the first away followed by William Dunlop, Ian Lougher, Rob Barber, John McGuinness, Michael Rutter and Ian Hutchinson. Lougher, Barber and Rutter were all on their Lightweight bikes as was James Hillier. Dunlop was the quickest on the opening lap at 124.650mph closely followed by Anstey (123.649), Johnson (123.638), Martin (122.639) and McGuinness (122.349). 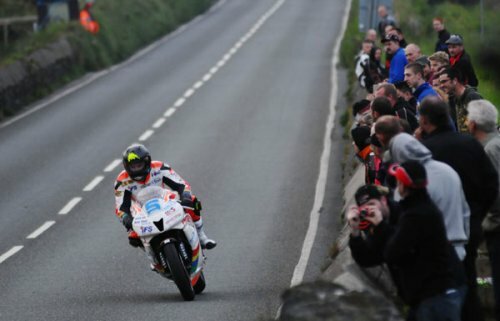 Ryan Farquhar was also over 120mph whilst Lougher was the quickest Lightweight machine with a lap of 113.023mph. Hillier was only slightly slower at 112.952mph with Rutter also over 112mph. However, the red flag was being displayed from the startline to Cronk y Voddy due to an incident at Sarah’s Cottage and there was a 25-minute delay before practice resumed at 8.05pm with the session for Superbike, Superstock and Supersport machines. Michael Dunlop was forced to stop at Ramsey Hairpin when some debris got caught in his radiator but Gary Johnson, James Hillier and Ian Hutchinson had no such problems and all completed their laps in excess of 125mph although Guy Martin was the quickest at 126.939mph. William Dunlop was once again the quickest 600 but Dan Kneen was out at Quarterbridge. With damp patches in the Glen Helen section, speeds were a bit down on the opening lap but, second time around, the pace quickened, none more so than Anstey and Rutter who circulated in close formation. The duo topped the Superbike session with speeds of 128.815mph and 128.072mph respectively and, although many of the fancied runners failed to go quicker, good laps were posted by David Johnson, Daniel Hegarty and Grant Wagstaff, with the latter posting a first ever 120mph+ lap. Hutchinson, Lougher, Farquhar, Lee Johnston, Simon Fulton and Michael Niblett were all posted as retirements whilst Karl Harris was the fastest newcomer at 119.017mph. Dean Lindley/Leon Fitzpatrick had an accident at Douglas Road Corner. Lindley was OK but Fitzpatrick was transported by Airmed to Nobles with back pain and possible fractures. Newcomer cott Lawrie and his passenger James Neave were attended to by a TM at Ballaugh but were both OK. In the incident that involved the red flag Stefan Holz was off at Sarah’s but was conscious with a right arm injury. In a change to the schedule tomorrow’s final qualifying session will now be a split session with Sidecars out at 18.20, Lightweight and all solo newcomers at 19.15 to 19.55 and Superbike, Supersport and Superstock at 20.00 – 20.50 with all solo’s getting the chance to test Pit lane limiters.